In 1832, the Anti-Masonic party held the first national political convention ever, because they wanted to open up the presidential nominating process to the voters. For the first time, the process included delegates (individuals that are chosen to select the candidate to represent the party). In 1832 the party nominated William Wirt for President. The Democrats and Republicans followed suit later that year, nominating Andrew Jackson and Henry Clay, respectively. 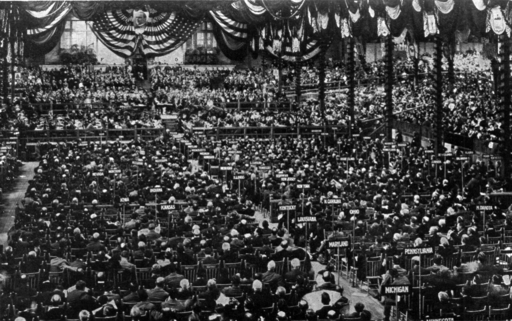 By the mid 1800’s, political conventions became the main process through which parties chose their presidential nominees. 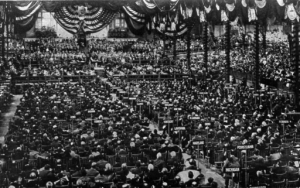 Early conventions often had many rounds of voting that led to a prolonged nominating process. For instance, Democrats did not nominate Franklin Pierce until 49 ballots had been cast. Because the process was often tedious, bargains and back room deals were a common feature of early conventions, and the selection process would often result in a compromise between key figures in the party. Many conventions contained a proverbial “smoke-filled room,” where party leaders would have met to decide on the candidate they wanted to run for the White House.